An estimated 36,000 people took part is a series of protests across France on Tuesday and Wednesday. 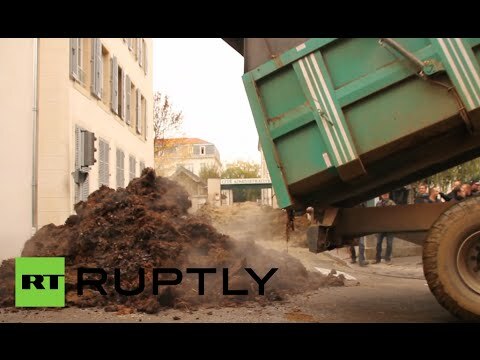 French farmers angered by overregulation, sluggish economy and lack of protectionism dumped 100 tons of manure, rotting vegetables and hay in front of a local administration building in Chartres. Similar action took place in Tours, Western Nantes and Toulouse. Protesting farmers dumped manure, hay and blocked traffic with their tractors during protests in the Toulouse and Nancy. The strikes are a response to what the protesting farmers say are increasing constraints and charges imposed by the European Union and French government on the nation’s agricultural community, in particular the reforms to the EU’s Common Agricultural Policy (CAP).